Beyond helping people directly by providing needed local programs, the ladies involved in Hull House were active in social reform on the local, state, and national levels. Through their efforts, legislation was enacted regarding child labor, education, worker's compensation, occupational safety, and other significant social issues. Hull House was thus the home not just for individual advancement but also for changes that impacted society as a whole. As founded by Jane Addams and Ellen Gates Starr, the main purpose of Hull House was to provide social and educational opportunities for working class people within the urban Chicago neighborhood, many of whom were recent immigrants to Chicago’s Near West Side. During a trip to England with colleague Ellen Gates Starr, Jane Addams was inspired by a tour of London’s Toynbee Hall settlement house in which she and Starr observed firsthand the philanthropic efforts of the social settlement movement. Like most European settlement houses, Toynbee Hall was established in response to the social problems associated with rapid urbanization, industrialization, and immigration that affected the streets of London. Recognizing certain similarities within the United States, Addams and Starr were at once inspired to launch a similar program within urban Chicago. Upon their return to the United States, Addams and Starr established America’s first settlement organization, naming it Hull House after the abandoned Hull Mansion which they acquired on Halsted Street. Hull House took its name from the original mansion built by real estate developer Charles J. Hull in 1856. At one time located in a prestigious part of Chicago, by 1889 Halsted Street had descended into squalor in part due to the rapid and over-whelming influx of immigrants into the Near West Side neighborhood. In its dilapidation, Charles Hull granted his former home to niece Helen Culver, who in turn granted it to Addams on a 25-year rent-free lease. By 1907, Addams had acquired thirteen buildings surrounding Hull's mansion, making Hull House the largest settlement house within North America. Jane Addams ran Hull House as head resident until her death in 1935. As an organization, Hull House provided kindergarten and daycare facilities for working mothers, citizenship classes for recent immigrants, and served as a meeting house for local trade union groups. Hull House also housed an art gallery, extensive library and small performance theater. Upon its settlement in 1889, Hull House’s major surrounding ethnic groups included large families of Italian, Irish, Greek, German, Russian, and Polish immigrants. In the early 1920s, Halsted Street also housed a large population of African-Americans and Mexicans. 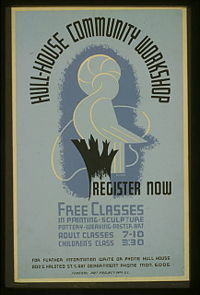 Free of charge, Hull House offered classes in literature, history, and art as well as various forms of entertainment including concerts, lectures, and clubs for both children and adults. Among the courses they offered was a bookbinding course, which was a timely given the contemporary employment opportunities in the printing trade. A movement followed in which more than one hundred similar organizations were established nationwide by 1900. By 1911, Chicago itself was home to more than 35 settlement organizations. Throughout her time at Hull House, co-founder Addams recorded numerous accounts regarding the social work efforts of her settlement organization. In addition to publishing 11 books and countless articles on Hull House’s state of affairs and political objectives, Addams also maintained a demanding international lecture schedule which helped to promote and advance similar social movements worldwide. While active with Hull House, Addams also founded the Chicago Federation of Settlements and the Neighborhood Centers, while maintaining a leadership position within the National Consumers League (NCL) and serving as the first female president of the National Conference of Social Work. The Hull House facility remained at it Hasted Street location until 1963 upon its purchase by the University of Illinois, Chicago in 1963. During the two decades following its establishment, Hull House attracted various female figures including Grace and Edith Abbott, Sophonisba Breckinridge, Florence Kelley, Mary Kenney O'Sullivan, Alice Hamilton, Julia Lathrop, and Alzina Stevens. Many of these women would rise to become prominent and influential reformers at all levels. Under such leadership, Hull House and many of its residents fostered an acute political awareness, advocating for legislative reforms at the municipal, state, and federal levels. Priorities included child labor laws, women's suffrage, and immigration policies. Among their greatest success, Hull House residents helped to launch the Immigrants Protective League, the Juvenile Protective Association, and the Institute for Juvenile Research. Hull House also played significant roles in the 1912 creation of the U.S. Children’s Bureau and the 1916 passage of federal child labor laws. At the grassroots level, volunteers established Chicago’s first public playground and bathhouse, pursued educational and political reforms, and investigated housing, working and sanitation issues. At the municipal level, Hull House’s steadfast pursuit of legal reforms led to the establishment of the United States' first juvenile court. Members also influenced areas of urban planning and directed the nationwide transition toward branch library systems. At the state level, Hull House associates influenced legislation on child labor laws, occupational safety and health provisions, compulsory education, immigrant rights, and pension laws. Seeking success at the federal level, Hull House began working with the settlement house network to champion a highly progressive agenda including women’s suffrage, unemployment compensation, and workers' compensation. Hull House also set out to ameliorate various effects of poverty throughout Chicago, establishing a public dispensary to provide nutritious food for the sick, a child daycare center, and public baths for Chicago’s underprivileged population. Hull House was also well known for its success in aiding urban assimilation programs, in particular for its role in helping to Americanize immigrant youth. The settlement also became the center of the movement to promote hand workmanship as a moral regenerative force. Journalist Paul Kellogg once referred to the group of Hull House residents as the "Great Ladies of Halsted Street” in reference to their philanthropic efforts and success. After the death of co-founder Jane Addams, Hull House continued to serve the community around the Halsted location until its displacement by the urban campus of the University of Illinois. The philanthropic efforts of the original Hull House settlement continue to be performed throughout the city at various locations under the Jane Addams Hull House Association. This association has, since 1962, perpetuated the name and many of the aspirations of the original institution and its members. The original Hull House building has been converted into a museum and stands as a part of the University of Illinois’ College of Architecture and the Arts. It remains open to the public. ↑ Paul F. Gehl, “Book Arts” in The Encyclopedia of Chicago, edited by James R. Grossman, Ann Durkin Keating and Janice L. Reiff (Chicago, IL: The University of Chicago Press, 2004, ISBN 0226310159), p. 87. ↑ Gerald R. Gems, “Clubs: Youth Clubs," in The Encyclopedia of Chicago, edited by James R. Grossman, Ann Durkin Keating and Janice L. Reiff (Chicago, IL: The University of Chicago Press, 2004, ISBN 0226310159), p. 181. ↑ Wayne McMillen, SSA Tour: Edith Abbott, The University of Chicago School of Social Service Administration, 2007. Retrieved August 7, 2007. ↑ Mary Ann Johnson, “Hull House” in The Encyclopedia of Chicago, edited by James R. Grossman, Ann Durkin Keating and Janice L. Reiff (Chicago, IL: The University of Chicago Press, 2004, ISBN 0226310159), p. 402. Darling, Sharon S. 2004. "Arts and Crafts Movement" in The Encyclopedia of Chicago. Chicago, IL: The University of Chicago Press, 2004, ISBN 0226310159, p. 49. Gehl, Paul F. 2004. "Book Arts" in The Encyclopedia of Chicago. Gems, Gerald R. 2004. "Clubs: Youth Clubs" in The Encyclopedia of Chicago. Bousquet, Marc. “Jane Addams and Hull House.” University of Louisville. Retrieved August 7, 2007. Johnson, Mary Ann. 2004. "Hull House" in The Encyclopedia of Chicago. This page was last modified on 19 January 2018, at 19:32.